I´m a heavy user of the WordPress App, back in the WordCamp Spain 2010 ask and capture a removed featured in the early stage of the app, then I feel like the connection between App and WP Dashboard will be complex. But recently, Hugo (fantastic guy I met in that WordCamp Spain 2010) posted about the new WordPress App optimized for iOS7. The design follow the style of the “future backend” MP6. Check this post [ES] of the redesign of the WordPress Dashboard. This new design remove all volume styles, left it more flat, more simple and clean. BTW I love the direction the UI Team is following. Why? it almost all Themes use this option to manage correctly the sizes of the images of a post with thumbnail sizes. Put it in there is like relegate the Featured Image to a third place, a good place could be directly in the bottom bar. Also I don´t understand why it ask the size of the featured image when I think this is handle by the Theme code, right?. When the Featured Image is related to the post, the only way to saw it is go inside the settings subsection, why? Could be more easy if we know the featured image is used right in the edit screen, again using the bottom bar. 2. Where is the image? I made some tests, using Image Post Format, normal post format and fast photo post. This are how they look after publish, I mean if you want to edit the entry. The main difference depened of the Theme, if the Theme is capable of show each entry in a different “template”, but when you are editing the post with featured image doesn´t have the image in the editor, normal, but in a mobile experience is necessary. And there are not difference between Image Post Format and Fats Photo Post, so why those options? If the idea is fast publishing, allow the user know and see the content, not in code, see the content, is not easy to edit code on smartphone screen size. I know post formats are controversial UI and is not solved yet. With three different ways to add an image and create a post, this makes very confusing for a normal or new user. This is the kind of problem the Desktop interface is affecting mobile experience. 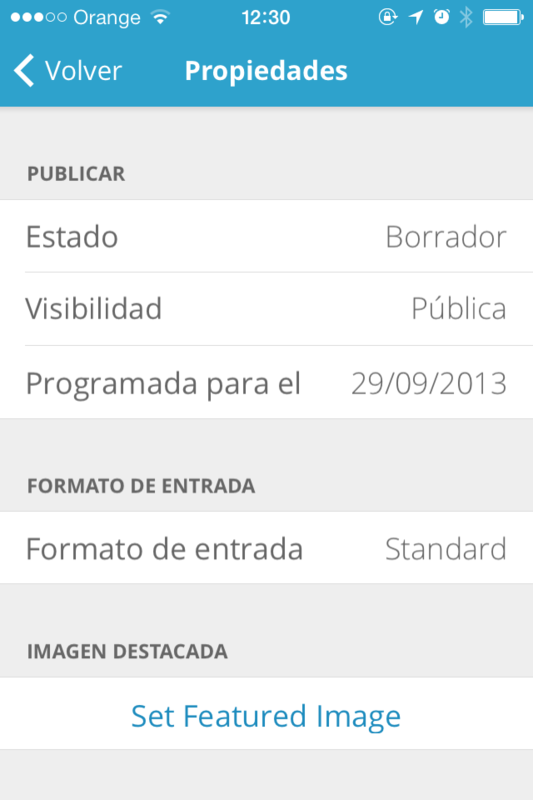 Maybe WordPress Mobile App should define the path for Desktop Dashboard in relation of publishing content. Small text in the posts list display the number of comments will help. But If I want to comment my own post?, the only way I found was going to web frontend and comment the post. 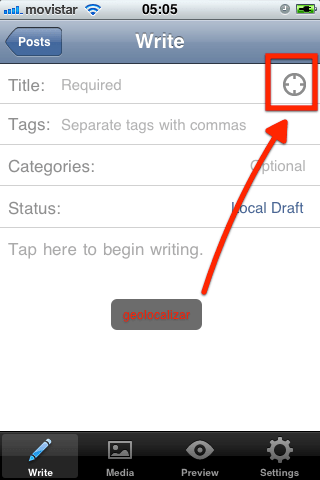 Only Drafts are highlighted, why don´t scheduled, pendent review, or event post format? With the new iOS 7 touch events, the app can use slide menu to access into a fast access for, Post status, Featured Image & Categories and more in the dropup menu. Thinking to have the fantastic Desktop QuickEdit. I have many subsites inside some multisite installations, this means every time I create a new subsite and I want to administrate them using the Mobile App I have to add my user and password, this is very annoying and disturbing, why?, sure must be a technical reason, but is not helpful. With a option like this just need to register the main site and the super admin user and password, then displaying all subsites selecting which ones to add/remove from the App. The idea of the Featured Image is first know if there is one, and second can be empty if there is not a featured image, this means you can add one from there. An easy and cool mobile up will be useful beyond blog fast publishing or easy content creation, also will help administrate a WP site, personally I use P2 as a project wall and the app offer enough features to interact and administrate content while I´m not in front a PC, mostly comments, but felt problematic sometimes. On my clients experience, they will love to used, but can´t understand it easily. Could be the last Automattic acquisition the answer for a better writing tool ? For new users and readers, you can download the WordPress App true iTunes, do it, test it and share your thoughts. Sorry for the Spanish Screenshoots. This post Featured Image is from @hugobaeta post. There are a lot of user experience scenarios that need attention. I really like you pointing out the Featured Image problems. I think, in my opinion, that it should all be part of the “Media” dialog. It could all live there (avoiding adding more primary actions to that icon action bar). What do you think? My idea about featured image is to give it the importance it need, related to content creation and the relation is have in the themes. Other is the big point, ¿Should the WP App follow the structure of desktop wp-admin? A good idea could be create a poll to know which are the must for the app.